the fiercest forces of nature: fire. mean we’ve totally locked it down. That's why we invented fire extinguishers. We’ll show that stupid fire who’s boss. over fire and fire safety than ever before. But the inventions are worthless if you don’t know how to use them. 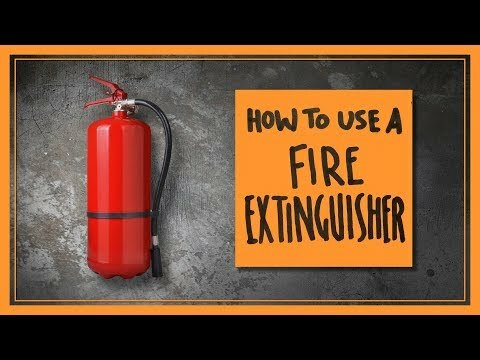 So let’s go over how to use a fire extinguisher! Step Zero: Before the extinguisher. alarms are working and have charged batteries in them. take the batteries out to get the smoke alarm to stop screaming. If you can help it, try not to do that. But if you do, make sure you put them back right away. Set a reminder on your phone, or tie a string around your finger if you need to. Talk with everyone who lives in your household about your evacuation plans. But if you’ve got that part all set, it’s time to get a fire extinguisher. Step One: Choose the right extinguisher for you. This one needs to be done before you have a fire. even your friend’s hair as they bring you a birthday cake. Each kind of fire has good and bad ways to put it out. You wouldn’t want to throw water on an electrical or a grease fire, for example. And K is a kitchen fire. Nobody knows where E through J went, so don’t ask. of fire it’s safe to use on. They’re messy because they spray powder everywhere. like a trick birthday candle. which is usually just for class B and C fires. local fire department or ask at the fire safety supply company. Also, try to find an extinguisher with a metal head and handle instead of plastic. These can be recharged easily, which saves on maintenance costs. Step Two: Judge the fire. It is important to realize that you are probably not a fire fighter. If you are, then why are you watching this video? Portable fire extinguishers are only meant to fight small fires that aren’t spreading. They won’t do much if most of your house is already on fire. a fire, then get out and leave it to the professionals. Step Three: Get in position. This is a requirement for both you and the fire extinguisher. Fire waits for no one, so your extinguisher should never be stored somewhere hard to access. it somewhere that you can get to easily. A fire is way more dangerous if you’re also caught in a mouse trap. The important thing for you is to keep your distance. to reach with the extinguisher. And remember: don’t let the fire get between you and an exit. from the head and handle. by the ring and yank. Hitting the top of the flames won’t do anything, so you need to aim for the base. Are you gonna capture it, or just let it slip? Don’t let it slip, just squeeze the handle. Step Seven: Sweep across the fire. over the base of the fire. cover the whole base of the fire in a couple sweeps. If all goes according to plan, you should no longer have a fire! If you do, then get out and call the fire department as soon as possible. Remember the doors and windows on your way out. Step Eight: Make sure the fire is actually out. You don’t want to be caught off guard, so it’s good to verify. Make sure you don’t walk anywhere that was previously on fire. If it reignites, you don’t want to be standing in the middle of it with an empty fire extinguisher. and call the fire department. should call the fire department to come check it out and tell you how bad it is. Step Nine: Maintain your extinguisher. Any time you use an extinguisher, you should get it recharged or replaced immediately. You don’t want to forget until it’s too late. Once a month, take a look at that little gauge and make sure it’s in the green zone. you need it, and every second counts. supply store and get it recharged. If it’s plastic, you can try to get it recharged but it may not be possible. If you can’t get it recharged, just replace it. The peace of mind is worth the price of a fire extinguisher. debris, and the pin isn’t stuck. give it a good shake since you’re checking it anyway. to make sure it’s safe. Exploding fire extinguishers tend to cause more problems than they solve. Once you do all that, your fire extinguisher is ready to fight another day! Hopefully it won’t have to, but better safe than sorry. Thanks for watching, and thanks for keeping up on your safety. us so we can keep teaching you how to adult, you can go to patreon.com/howtoadult. Thank you for watching, and thanks for keeping up on your safety.